The capacity crunch the trucking industry is currently facing poses a major threat to all parties involved. There are a myriad of reasons for the tightness in the market, with each one compounding on the next. 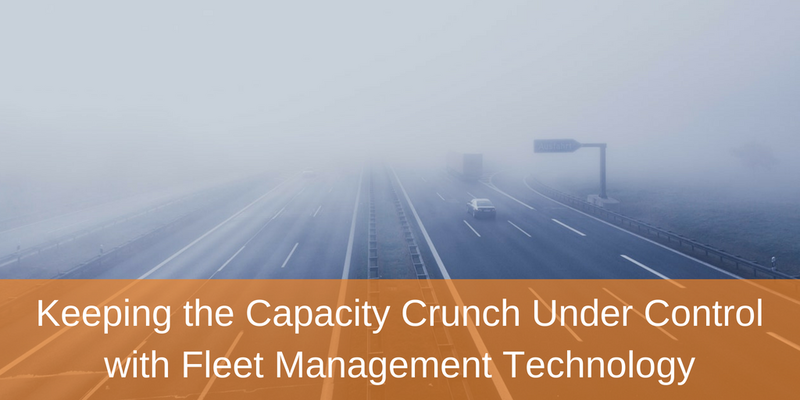 With the right fleet management technology, businesses can minimize the impact that this capacity crunch has on their operations. Understand some of the main reasons for this tightened capacity and how to utilize fleet management technology to keep your organization ahead of it. There is an unprecedented combination of driver turnover and driver shortage in today’s transportation industry, creating the perfect storm. PLG Consulting estimates that the industry is short about 60,000 drivers and that will increase to 160,000 by 2026 if nothing changes. The main factor for this shortage is the average age of the current workforce and the younger generation’s disinterest in driving. The trucking lifestyle does not appeal to younger people -- sleeping in a truck, being away from family for extended periods of time, etc. When current drivers are retiring, younger workers are not entering the industry to replace them. Driver turnover rates are also at extremely high levels. PLG Consulting stated that, “big and small TL fleet turnover from 2016 to 2017 ranged from 64% to 90%.” This is not a sustainable level for any business. Due to the demand for drivers, organizations are being forced to increase driver pay to attract more of them. Depending on the carrier, driver pay has increased anywhere from 10-20% this year, according to Odyssey Logistics. The mandate will have a large impact on pickup and delivery windows due to keeping a strict limit on HOS. In the past, some drivers would drive more hours than legally allowed because paper logs could be manipulated easily. Now, a lane that used to take just one day when a driver went a little over the HOS limit will take two days, further limiting capacity. Other government regulations are contributing to the capacity crunch as well. Organizations will have to adopt new processes in order to be in compliance of the new regulations and not get penalized. With the right fleet management technology, the impact this capacity crunch has on your business can be greatly decreased. In regards to the driver shortage, businesses are able to use the drivers they do have in a much more effective way. Available hours can be monitored in real-time, allowing the correct number of drivers to be scheduled and plan out efficient routes to get them back quickly. Quality technology will also allow you to minimize deadhead, increasing your bottom line. Creating better, faster routes will help lessen the impact of the ELD mandate, letting drivers travel further distances in less time. With all of the money saved and additional revenue garnered from more loaded miles, organizations have the opportunity to offer higher pay and attract more drivers, growing their business. There is not a single solution that will ease the capacity crunch on its own -- it takes forward thinking and flexibility in order to stay ahead. Want to see what quality fleet management technology really looks like? Contact us today and we’d be happy to schedule a demo!